As ocean water warms up, it expands like the liquid in a thermometer, so sea levels rise by a small amount. But gauges like this show a much greater actual rise, indicating that melting ice is adding to the problem. The effects of rising global temperatures are often dramatic on land, causing heatwaves, wildfires, and vanishing glaciers, but their impact on the oceans is less obvious. So far the oceans have not warmed as much as the continents. This is partly because they warm up more slowly. In fact the heat that they have absorbed will make deep oceans keep warming even if all greenhouse gas emissions stopped tomorrow. This will make the ocean water expand, raising sea levels. Meltwater from continental ice sheets is also pouring into the oceans, making sea levels rise much more. 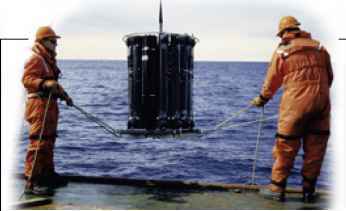 Warmer water at the ocean surface reduces plankton growth and carbon dioxide absorption. It also causes more intense storms that sweep over nearby continents, sometimes with catastrophic effects. 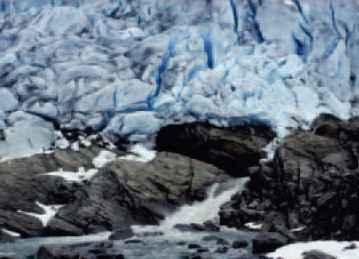 The extra water that is making sea levels rise is coming from melting glaciers and continental ice sheets. If floating sea ice melts, this makes no difference to sea level because the floating ice is already in the sea, and simply changes from solid to liquid. But when ice on land melts, the water that it contains is transferred to the ocean. If this glacier melts away completely, all its water will flow into the sea. In the polar regions, and in a few other places, glaciers flow all the way to the sea. The ends of these glaciers are floating, so when lumps of ice break off, they drift away as floating icebergs. 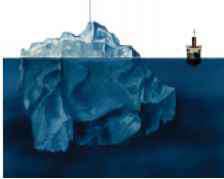 Some of these icebergs are huge, and since they float with up to 90 percent of their bulk underwater, they are all much bigger than they look. 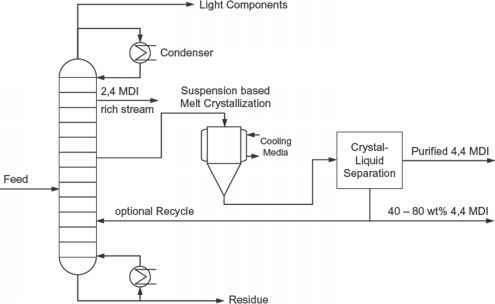 They can raise sea levels in the same way as meltwater, whether they melt or stay solid. They can also be a serious hazard to shipping. Rising sea levels have already started destroying the coral island nation of Tuvalu in the Pacific, where most of the land lies just 6-10 ft (2-3 m) above sea level. Higher tides are making waves surge further inland, swamping houses and contaminating farmland and water supplies with salt water. Since sea levels are expected to keep rising for 1,000 years after all greenhouse gas emissions stop—and for longer if they don't stop —the 11,000 citizens of Tuvalu will have to evacuate their islands, almost certainly forever. Other low-lying nations such as the Maldives are just as vulnerable. 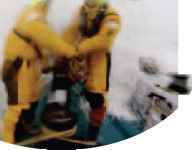 Dense, salty water at the surface of the northern Atlantic sinks and pushes currents through the deeper parts of the world's oceans. But melting icebergs, glaciers, and permafrost add fresh water to the oceans, making them less salty, and this affects the mechanism that drives the deepwater currents. The north Atlantic deepwater flow could slow by up to half over the coming century, disrupting the global circulation of water. 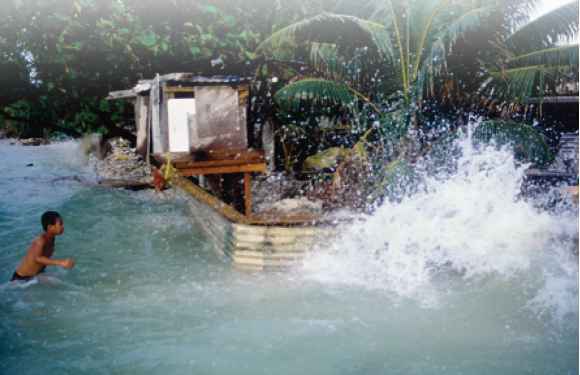 Storms that build up over oceans can cause havoc if they reach land. The storms develop because the Sun's heat causes warm, moist air to rise, creating an area of low pressure at the water's surface, and thick clouds above it. 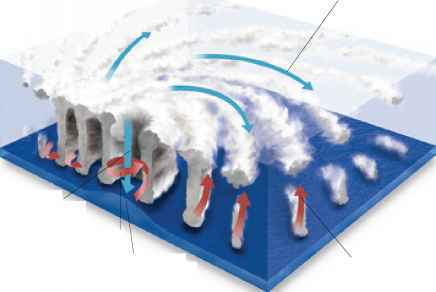 The low pressure draws in more air, which forms a circular wind system called a cyclone. Over tropical oceans cyclones can develop into destructive hurricanes. About one quarter of the carbon dioxide that we add to the air is absorbed by the oceans. It dissolves in the water and a lot is taken up by marine plankton. However, most warm oceans do not contain much plankton, and the oceans are getting warmer. The stormy Southern Ocean around Antarctica—seen here swamping the deck of a racing yacht—also appears to be so loaded with carbon dioxide that it cannot absorb any more. This could be a serious problem, because it accounts for 15 percent of the carbon dioxide soaked up by oceans each year. More intense storms caused by warmer oceans seem to be increasing rainfall in the temperate north by 5-10 percent, causing floods like those that hit England in 2007. Unusually heavy rain has also struck the tropics. 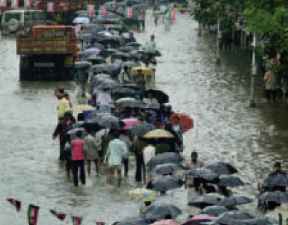 The deluge shown here occurred in July 2005, when a massive 37 in (944 mm) of rain fell on Mumbai, India, in 24 hours—50 percent more than the previous record. 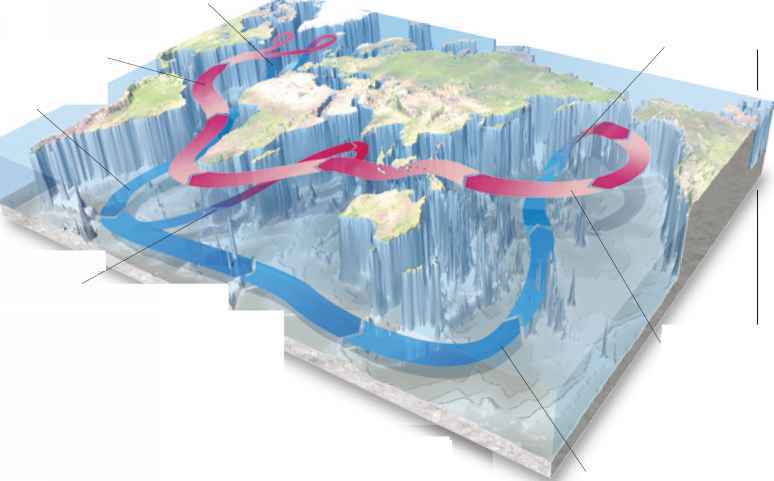 Ocean currents have a powerful influence on climate because they redistribute heat around the globe. These sampling bottles gather water samples from different depths, so scientists can record their temperature and chemistry. This enables them to work out if and how current flow patterns are changing.